Alien Life Chess Set by ethanjurman is licensed under the Creative Commons - Attribution license. This is an "Alien Life" chess set. Inspired by the Black Marker in Dead Space (and 3d prints of it, found on Thingiverse: http://www.thingiverse.com/thing:1538807) this is an original chess set, designed by myself and modeled in blender. 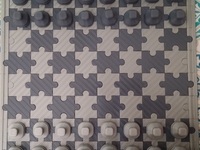 I haven't had too much experience in printing 3d models (except for another chess set I made a long while back), so any feedback or comments would be much appreciated! Thank you so much @tselling for the most excellent pictures of the pieces lined up! 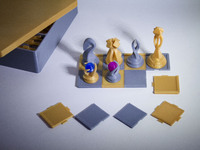 And thanks to Access3Dservices for the awesome pictures of the pieces on the print bed (black and white - full set)! Checkout their Instagram for more awesome stuff! Thanks guys for the awesome feedback! If you have some pictures of the set I'd love to see it! UPDATE: MAY 22nd 2016: I have re-uploaded all the files in proper mm units (with the king being 37.25 x 37.25 x 80.75 mm or 1.46 x 1.46 x 3.18 in). 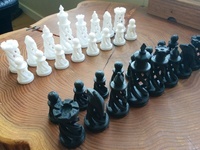 I have also included a full set including 8 Pawns, 2 Rooks, 2 Bishops, 2 Knights, a King, and of course a Queen. UPDATE: JUNE 16th 2016: I have re-uploaded (again) all the files. Thanks to the help of cymon, whose helped me make the set more print ready! Also, have run it through Microsoft / Netfabb's 3d model fixer - https://netfabb.azurewebsites.net/, but if there are any issues please mention it. Again THIS IS A WORK IN PROGRESS... so I will occasionally make changes. These changes make the set more print friendly (especially for FFF printers), or for aesthetic reasons. While the Pawn and Rook are mostly unchanged, the bishop should be slightly more FFF friendly, the Knight looks more like a classic Knight piece, King has thicker limbs as does the Queen for easier printing. UPDATE: JUNE 20th 2016: Uploaded new versions of King and Knight (and updated FullSet and PieceSet for those respective changes). I can say that I'm now really pleased how all the pieces came out- sorry for making so many changes. This will be my last change for a while (unless there is a glaring issue that needs resolving). Any feedback is welcomed, design or otherwise. Thanks! Say thanks by giving ethanjurman a tip and help them continue to share amazing Things with the Thingiverse community. Say thanks and help ethanjurman continue to share amazing Things with the Thingiverse community. You'll need a PayPal account to tip ethanjurman. Click the button below and you will be redirected to PayPal. Once the payment is complete, you'll be brought back to Thingiverse.